Our Victorian Townhouse offers cosy, family friendly Bed & Breakfast in the popular town of Alnwick. Ideally situated, close to Alnwick Castle, The Alnwick Garden and many cafés, restaurants and pubs. Castle Gate Guest House offers three-star family-friendly accommodation in an ideal location. Each room has a private bathroom, with clean towels provided daily, and comes with a wardrobe, flat-screen television and free WiFi. Tea and coffee making equipment is provided. A very tasty full English or vegetarian breakfast is served in our bright and airy dining room. A sun terrace is also available to our guests. Free parking is available at the front of the property. 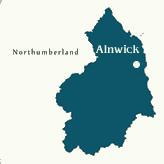 The Guest House is situated in Alnwick town centre, just 150 yards from Alnwick Castle, a two minute walk to the famous Alnwick Garden and a short drive from Northumberland's beautiful coast. Alnwick, one of the main towns of Northumberland, is situated just off the A1. It is a delightful rural town, full of independent shops, public houses, restaurants and cafés.